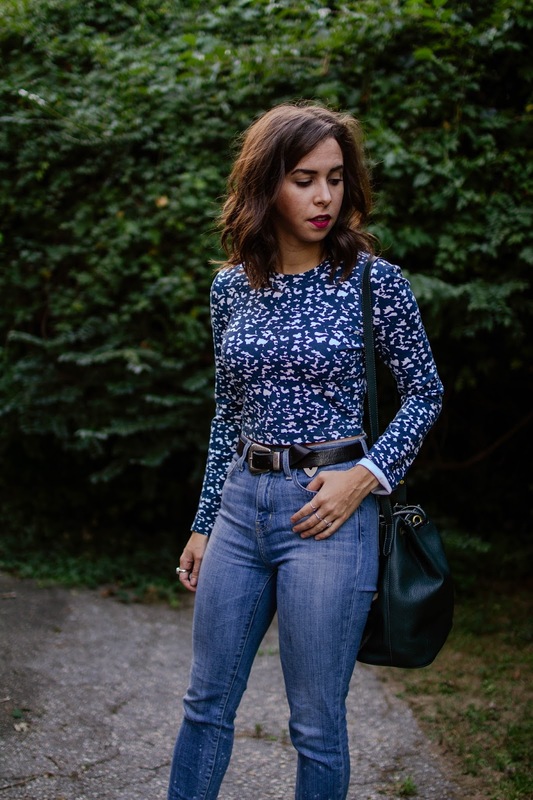 With the weather slowly warming up, I wanted to share one of my favorite outfits that I wore on a regular basis last fall that’s perfect for either season. I often like to describe myself as a dressy yet casual person. When I do decide to go out on the weekends, I love to opt for my most comfortable jeans and assorted tops depending on the setting for the evening. If you aren’t familiar with Arlington, Virginia, it’s a pretty casual place. In terms of weekend bar options, almost every local establishment is either a sports bar or wine bar. Because of these fairly simple options you can understand why denim is the best and safest outfit of choice (especially in colder weather). As I have mentioned before here, these Current Elliott super high-waisted jeans are my favorite irrespective of the occasion. The fabric, hem, fit, and rise are my definition of the perfect jeans so these tend to be my normal “go-to” jeans. My favorite casual, going-out outfit is the high waisted jeans and crop top combo. The crop top can show as much, or little, skin as you wish depending on the hemline of the top or the rise of the jeans. This particular top from The Fifth Label has a little bit of a longer hemline that hits right above my jeans. I love the fun print and the sliver of skin that peeks through depending how I’m standing. Even though I have been in a non-heel mood recently, I love these d’orsay pumps from Schutz that I purchased a few years ago. Even though I’ve had them for awhile this is their debut on the blog. The heel height can be a little scary, but these beauties have nice little grippers in the back so your foot doesn’t flop in and out. The great thing about this outfit is that I can sport these amazing heels or throw on a more casual shoe depending on how I am feeling for the night. Love this outfit!! I might need to copy this haha!